Many years ago, when I started brainstorming home-based business ideas, many occupations came to mind, event planner, professional organizer, doula, and personal concierge. But when I asked myself, “How do I envision my daily life?” it didn’t include running all around town, being on call, working holidays, nights or weekends. When I sat down and mapped out my dream career, it involved working from inside my home with a schedule that was super flexible. Meaning I could work any hours from anywhere in the world. While there are a lot of home-based business opportunities out there — many of them require you to work standardized hours or to leave the comfort of your home. If you want to have complete freedom over your schedule, then check out these flexible home-based business ideas that allow you to work whenever you want. 1) Blogger — Do You Want to Be an Online Influencer? Obviously, I’m a huge advocate for starting your own blog. But let me tell you why blogging is such a great business to start. It builds a business platform for other opportunities like freelance writing, coaching, speaking, marketing, or even direct selling. Introduces you to people and opportunities you would not have been privileged to before. It takes very little money to start and run. When you’re a blogger, you’ll be doing many different tasks at once. You’ll be researching, writing, editing, and taking photos for blog posts so that you can publish excellent content. You’ll have to deal with tech issues, like adding new plugins, modifying your sidebar, or trying to figure out why your site is running slow. Another task will be distributing your articles on social media channels like Facebook, Twitter, and Pinterest. You will also be interacting with readers through blog comments, social media platforms, and email. And don’t forget about providing customer service and support to your advertisers and sponsors. While it takes time to make money from blogging, it truly is one of the most flexible careers you can have, and you get to write about what you love! Bloggers make their money in a multitude of ways from direct ad sales, affiliate marketing, working with ad networks, corporate sponsorships, brand ambassadorships, sponsored blog posts, holiday gift guides, coaching, selling products, informational programs, e-books, and webinars. How much you earn as a blogger will depend greatly on your determination, mindset, and niche. Michelle Schroeder blogs over at Making Sense of Cents and is currently earning six figures a month! Yes, you heard that right, six figures a month! The majority of her income is made through affiliate marketing and product sales. You can find out more about Michelle and how she does it in this post. She also teaches her affiliate marketing methods in her blogging course, Making Sense of Affiliate Marketing. 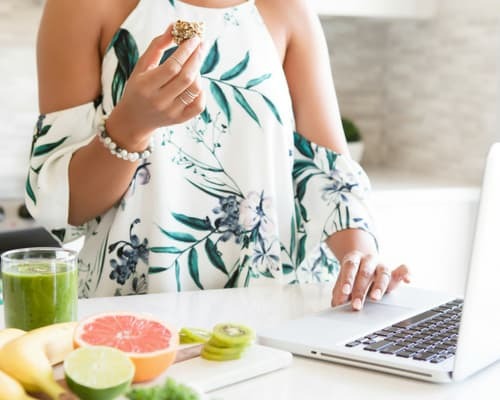 Ruth Soukup blogs over at Living Well Spending Less and currently leads a team of ten employees and earns seven figures a year! The majority of her income comes from product sales. You can find out more about Ruth and her blogging success here – and be sure to grab her free blogging book on boosting your blogging income. If you're interested in starting your own blog, I created a tutorial that will help you start a blog for just $2.95 a month. And for additional blogging information — be sure to grab my free blogging e-book! 2) Coach — Do You Enjoy Helping Others Achieve Their Goals? Being a coach means helping people better their lives through focused dialog and practice. So if you have a desire to help others, are dependable, a good listener, and non-judgmental — launching a coaching business may be the perfect idea for you. What type of coach you'll become will vary greatly upon the prior experience and training that you have. While some individuals specifically go to college or get additional training to become a coach, others fall into coaching, because they have extensive knowledge and passion for a particular subject matter. Here are just a few of the niches you can work in: Career coaching, business coaching, fitness and wellness coaching, life coaching, direct sales coaching, parenting coach, and the list goes on and on. Coaches can make money by facilitating one-on-one coaching sessions via phone, email, or Skype, group sessions, webinars, selling e-books and informational products, speaking, book writing, selling online courses, seminars, and mastermind groups. Traci Bild, founder of Get Your Girl Back, Sarah Dew Finks, founder of the Happy Entrepreneur, and Cynthia Occelli, founder of the Beautiful Life School are all making over $100K a year! Read about their coaching success here. 3) Freelance Writer — Is Writing Your Passion? As a freelance writer, you will research, write, and edit articles and documents for clients. Now, you may be thinking that you need an English degree to be a writer, but the truth is, anyone who enjoys writing can do it professionally. The types of projects that you take on will vary on your prior knowledge, skill set, experience, and interests. The best piece of advice for anyone who wants to be a freelance writer … write every day! The more you write, the better and faster you’ll get. Also make sure that you’re investing in your professional development by reading and participating in courses, webinars, and training. Write online articles, blog posts, newsletters, e-books, video scripts, white papers, case studies, ghostwriting, technical writing, advertising copy, resume writing, travel writing, newspaper articles, magazine articles, website copy, grant writing, brochures, sales materials, and training manuals. Laura Spencer has over 24 years of writing experience but came to the freelance world in 2002. You can read more of her story and freelancing tips here. 4) Social Media Marketer — Are You a Social Butterfly? When you’re a social media marketer you will manage companies social media channels, so you will need to know the ins and outs of the big seven: Facebook, Twitter, LinkedIn, Pinterest, YouTube, Instagram, and Google Plus. One of the best ways to land a social media gig is by having your own successful platforms and being active on them. You can also read and educate yourself on best practices — which this realm is constantly changing, so you’ll need to stay on top on trends, news, and updates. Setting up social media profiles and accounts, sending out social media updates, social media correspondence at live events, coaching, consulting, speaking, online listening strategies, writing an e-book, and selling informational products and webinars. As a new freelancer, Kristin Larsen launched a successful Pinterest management company and within her first six months, was averaging $3,600 a month – only working part-time! You can read more about Kristin's story here. 5) Virtual Assistant — Are You a Multitasking Maven? When you’re a virtual assistant, you help business owners with a variety of tasks, anything from answering email correspondence and making appointments, to editing, writing, bookkeeping, and social media management. What services you offer your clients will depend on your skills, background training, prior experience, and your passions. No special training is needed to become a virtual assistant, but polishing your skills and learning new ones is always a good practice. For resources and training make sure to check out VA Networking, or there are many good books and courses on this career. Offer administrative services, editing, writing, bookkeeping, social media management, translation, marketing, technical, design … In fact, check out this huge list of services that virtual assistants can offer, it's endless! Michelle Dale, Sherry Carnahan, and Michelle Mangen all run successful virtual assistant businesses from home — in fact, they’re all making over six figures a year! Read about their virtual assistant success here. 6) Travel Agent — Do You Love to Travel? Working as a travel agent might seem a little outdated in today’s world of Kayak and Airbnb, but in reality, many people still prefer to work with travel agents. Why? Because experienced travel coordinators help travelers save money, time, and all kinds of travel-related headaches. As a home-based travel agent, you'll collaborate with a host agency, and earn a commission on all travel arrangements you book. Not sure where to get started? Companies like Cruise Planners offers a home-based franchise opportunity that gives you the training and tools necessary to run your own business from home. Best of all it's 100 percent flexible (you can book travel anytime during the day or night)! Lori Foster is a former high school Earth Science teacher who became a Cruises Inc. independent vacation specialist. She wanted the ability to work from home when her children were babies, and the flexibility to create her hours so that she could attend school events when they got older. You can read more about her story here. 7) Transcriber – Are You a Fast and Accurate Typists? If you're a fast and accurate typist, you can work from home as a transcriber. Transcribers listen to audio clips and then type out the audio file into a written document. There are three basic types of transcription, general, medical and legal (medical and legal require additional training). While this seems like a job that anyone can do — you do need to possess excellent listening skills and an advanced understanding of the English language. Transcribers are paid on the amount of work they complete; sometimes the pay is per audio minute, and other times it's per page or audio file. Generally, the faster you can type, the more work you can complete, the more money you can earn. Again, this gig is completely flexible, you can do transcription work at any time as long as you meet your deadlines. Veteran transcriber, Janet Shaughnessy makes six figures as a transcriber, in fact, she wrote a course on the subject. You can read more about Janet and how she got started in this post. 8) Bookkeeper – Are You a Number's Geek? Do you love numbers? Are you organized and through? Then working from home as a bookkeeper may be your calling. Bookkeepers help small business owners manage their monthly income and expenses. With the right accounting software, bookkeepers can run their businesses 100 percent online, any time of the day. Bookkeepers don't need a college degree like accountants, but taking an online course or interning for a company can help you learn the ropes. To see if you have the right personality for bookkeeping, check out this free 3-part training from Bookkeeper Business Launch. As a home-based bookkeeper, you can take one of two routes. You can apply for a bookkeeping position (this post lists companies that hire bookkeepers) or you can start your own business. Each arrangement has its own set of pros and cons, but when you're your own boss you have more freedom, flexibility, and control over your finances. Callie Sitek started her work-at-home journey as a virtual assistant but then decided to make the switch to bookkeeping. Her business grew so much over a year, that she had to hire two additional bookkeepers for her business. You can read more about Callie's success here. 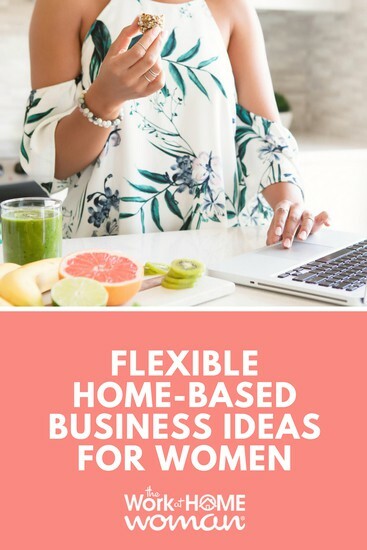 As you can see, there are lots of great home-based business ideas for women that will allow you to have a flexible schedule and make good money working from home. Now it's up to you to choose the right business for your personality and lifestyle. Do you have a home-based business? Is it flexible? If so, drop us a note below and let us know what you're doing to earn money from home. Originally published September 18, 2014. Content updated on July 2, 2018. I found you blog and thank you, I can’t stop reading it! The world seems to be full of the opportunities, if have even little time. I have just picked tiny social media tasks during last months from http://bit.ly/2JGo8T3 to make some extra earnings, and now seeking something new ideas for home business because really I love this! My challenge is to find stable income (because of my kids) with crowing opportunity, so maybe I need several ways how to earn money at home that I can in the future work 100% independently without any employer! Hi Holly, I am extremely interested in blogging, although my subject would be a little more dark than your average, missing people and unsolved murders. I have absolutely no clue on how to get started. What are some good resources to get going from ground zero? Wow, that’s an interesting topic! Have you signed up for our newsletter? We offer a free 28-page blogging e-book that tells you how to get started, how to create content, how to get traffic and monetize. Your freelance writing; what do you do in particular? Do you have a degree? What is your blog about? I’m looking to get into an at home gig but only have my highschool diploma and would not like to be in debt just yet. I’m 21 and work as a server because I want to have some free time to figure myself out. I have gotten job offers from highmark, PHEAA, etc so I know I’m capable of having a better job than I do now just would like to figure out a work from home solution before being tied down to a 9-5 again. Hi Kiana, I’m not a freelance writer. I’m a blogger and everything I learned about this industry, I learned online. I do have two college degrees, but I’m not using any of what I learned in college for my business today. My blog is about teaching others how to work from home. hi, new to the site , but I’m and artist, looking for or I can paint, digital art work using different media any tips. Hi Isabel, I haven’t heard of Forever Knowledge before. Have you tried their products out? Whichever company you decide on, you need to have a passion for what they’re selling. So, I would suggest trying out different products or hosting a party before joining an opportunity. Good luck on your journey and keep us posted! Indeed some great business ideas. But I work on only one of those and that’s freelance writing, it gives me my 90% of income and rest comes from my blogs, but I just love freelance writing, it is easy as I have good knowledge of various topics and it doe snot put too much burden on me. Glad you enjoyed the flexible ideas, Jelina. Freelance writing is such a great career, it’s so versatile! Thanks for stopping by!